Marinate with red chilly pwd, salt and corn flour. Coat the paneer well with the marinade and let it rest for 10 to 15 mins. Shallow fry the marinated paneer cubes to golden and crisp. Add grated garlic and ginger to hot oil. Add sliced capsicum and toss. Add red chilly pwd and salt. Add soy sauce and tomato ketchup. Make a paste of corn flour with 1/2 cup of water and add to paneer mixture. Sprinkle finely sliced spring onions. 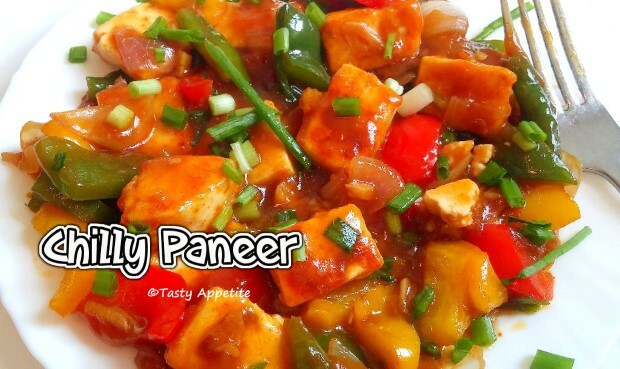 Yummilicious restaurant style chilly paneer is ready. Serve hot with fried rice, biryani, noodles or roti dishes.